"Top Picks Of The Week"
The first organic, fair trade-certified, and absolutely delicious chocolate made in America from bean by Theo Chocolate. WHAT IT IS: Organic, fair-trade origin chocolate. WHY IT’S DIFFERENT: It’s made from bean by the producer—meaning, raw beans are imported, roasted, and turned into bars and bonbons on the premises. Other domestic organic and fair trade producers buy their couverture from industrial producers. WHY WE LOVE IT: Very high quality, delicious and creative. The series appeals to origin chocolates, and the 3400 Phinney Bars are superb examples of fine chocolate on the cutting edge. 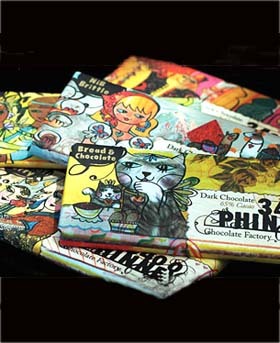 WHERE TO BUY IT: TheoChocolates.com. CAPSULE REPORT: If you’re a student of fine art, Theo is Vincent Van Gogh’s brother. If you’re a student of chocolate, Theo is the name of the first organic, Fair Trade Certified™ chocolate made in the U.S. The company is named for Theobroma cacao, the botanical name for the cacao tree, from which all chocolate springs. The genus name Theobroma was bestowed in 1753 by Swedish naturalist Carl von Linné (Carolus Linnaeus), who felt that the word supplied by the indigenous Americans—cacao—didn’t sound glorious enough. Theobroma means “food of the gods” in Greek: Theo = god, broma = food. We can conclude he really liked chocolate, though in Linneaus’ day, the chocolate bar had yet to be invented: Cacao was only available in the form of hot chocolate. As more people demand foods that are both organic and fair-trade-certified, there is more product on the market; but Theo is the first to scale the heights of world-class chocolate with superb dark and milk chocolate bars and truffles (bonbons). Now, along with honey and mead, the gods can enjoy some great chocolate bars and bonbons. Read the full review below. 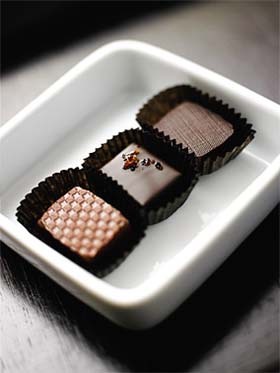 Read reviews of more of our favorite chocolates. Review the Table of Contents of the February issue of THE NIBBLE™ online magazine, plus the back issues archive and our most popular articles. All of the Top Pick Of The Week newsletters are permanently archived on TheNibble.com, in chronological order and by product category. 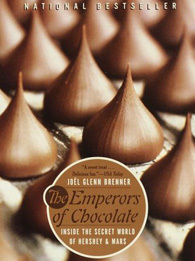 The Emperors of Chocolate: Inside the Secret World of Hershey and Mars, by by Joël Glenn Brenner. You’ll find that the chocolate industry is not so sweet as you take this insider view of the bitter legal and marketing battles, palace intrigue, and personality clashes that dominate giants Hershey, Mars and the candy industry as a whole. While Milton Hershey was a benevolent philanthropist, Forrest Mars was so tightfisted that his children never tasted an M&M: dad claimed he couldn’t spare any. Click here for more information or to purchase. 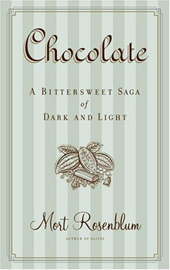 Chocolate: A Bittersweet Saga of Dark and Light, by Mort Rosenblum. From the refined workshops of Paris to the factories of Hershey, Pa., Rosenblum dishes delicious stories that demand their place in chocolate history. For example, the great Italian artisan house of Amedei was founded because, when on a tour of the Valrhona factory in France, Alessio and Cecilia Tessieri and their mother were dismissively told that Italians were not ready for Valrhona products! Click here for more information or to purchase. 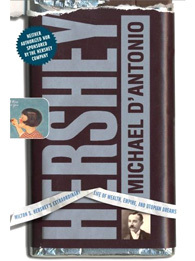 Hershey: Milton S. Hershey's Extraordinary Life of Wealth, Empire, and Utopian Dreams, by by Michael D’Antonio. The top chocolatier makes it possible for amateurs to achieve his artistry in dipped chocolates, truffles and molded chocolates. With his recipes for Earl Grey tea, burnt caramel and tarragon with grapefruit ganaches, plus some delicious baked goods (Recchiuti is also a patissier), this book provides many hours of happiness. Click here for more information or to purchase. When we learned last year there was a new U.S. chocolate company producing chocolate from bean, we got quite excited. Why? There is a handful of high-end domestic companies that imports raw cacao beans, roasts them, and begins the process to convert them into couverture chocolate from which bars, bonbons and other confections and pastries are made (read about the process in our article, From Pod To Palate). Yes, there are a few dozen large-scale industrial manufacturers that produce couverture chocolate to sell to manufacturers of inexpensive and mid-priced candies; and huge chocolate companies like Hershey’s and Mars roast their own. But you can count on one hand the number of U.S. producers of artisan-quality chocolate, comparable to those of European makers: some sell products under their own names (Guittard, Scharffenberger) as well as sell their couverture to others. Indeed, Theo has done its homework—and has earned an A+, we might add. The company has launched some stunning chocolate that any chocolate-lover should get to know. Upon first bite, it’s clear that the young company favors a darker roast, but by no means are flavor nuances compromised. Theo has done a magnificent job at finding a perfect balance and coaxing out maximal flavor from every bean they touch. The result is highly flavorful and world class chocolate that rivals— and in some cases, beats—the best from Europe. And while Theo certainly holds its own with its American and European counterparts, it offers what many of them can’t: 100% organic chocolate, Fair Trade Certified. * This makes Theo a double threat to the competition, and indeed, a formidable force in the chocolate world. *The majority of Theo’s chocolate is organic certified as well as Fair Trade Certified. This includes the origin chocolate from Ecuador, Ghana, Ivory Coast and Ecuador; the blended bars and the confections, both of which include organic and Fair-Trade Certified beans from the Dominican Republic. The Madagascar and Venezuela origin chocolate bars are organic but not yet Fair Trade Certified. They will become Fair Trade Certified when Theo is able to find quality organic beans from these countries that are also Fair Trade Certified. 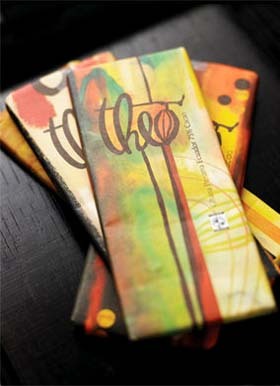 In fact, Theo is the only bean-to-bar producer in the U.S. with Fair Trade Certification. Farmers who belong to Fair Trade co-ops have access to credit, social, and educational benefits that consumers and companies can support through mere purchasing power. Theo’s president, Joseph Whinney, has long possessed a deep motivation to improve social and economic conditions of cacao farmers. And through Theo, a huge step forward is being made. Theo makes two types of chocolate bars: single origin chocolate and flavor-infused bars. 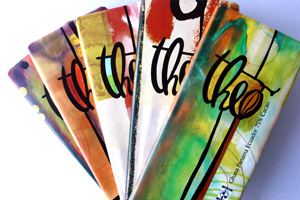 The Origin Bars are Theo’s signature line and consists of five bars, each of which features different flavors unique to its country of origin. The sugar used to sweeten the chocolate is not your typical cane sugar but beet sugar, organically grown in Sweden. Don’t worry, though: The taste is just as sweet and clean as cane sugar, which is evidenced by the marvelous flavor each bar delivers. See THE NIBBLE Guide to Chocolate Descriptors and Regional Differences: The Varying Flavors of Great Cacao Around The World, for more information about geographical impact on the flavor of cacao. Ghana 84%. Hands down, this is one of the most masterfully produced Ghana chocolates on the market today. Unusually complex yet bold, this bar goes above and beyond what’s expected from its origin and never relents with the unexpected. Blueberries, tropical fruits, and cream accent a monstrous chocolate wave, and then transitions to coffee and nuts as the end draws near. Grown in the region of Kumasi, it is Fair Trade Certified. Ghana-Panama-Ecuador 75%. This bar is a blend of the Ghana cacao, beans from the remote rainforest of Bocas del Toro, Panama, and Arriba Nacional cacao from Ecuador. With so much Forastero base in this chocolate, you know it’s going to be a winner. Blackberries start the show, but then an assorted mix of yellows and oranges take over, such as bananas, pineapples, and peaches, while raspberries and nuts close things off. Talk about complex! Fair Trade Certified. Ivory Coast 75%. If Ghana is excellent, then Ivory Coast is phenomenal. Again, this a Forastero that has much more to say than most beans of this variety. Clove, cinnamon, currants and bitter coffee all explode onto the palate to create an earthy-fruity balance not often experienced in a single origin chocolate. Fair Trade Certified. Madagascar 65%. A fruity and tart offering, but also a dark one as well, Theo treats a light cacao with a darker roast to deliver an overall darker chocolate. The contrast is quite apparent, as the dark tone of the chocolate contrasts acutely with the light flavors. Speaking of flavors, expect a myriad of them, including blueberries, cherries, orange and cedar in addition to a well-controlled acidity that gives flashy life to the fruitiness. Venezuela 91% Limited Edition. This bar is blend of cacao from Barinas, Merida and Tachiras, the remote western regions of Venezuela. Unfortunately, this is the one bar that is not a winner for Theo. The chocolate simply falls flat on the tongue: There just isn’t any roundness to even out the notes of green foliage, alcohol and must. It’s also not as intense as a 91% cacao would imply, so don’t expect a mouthful of pure cacao. Luckily, though, there is absolutely no bitterness whatsoever. Try it now, if you’re a student of chocolate, so you can see how it progresses as Theo (hopefully) tweaks the bar in future limited editions. This line is named after the street address of Theo’s factory, where each bar and confection is artfully crafted. The bars are organic and Fair Trade Certified, a blend of beans from Panama, Ecuador and the Dominican Republic. The dark chocolate has a minimum of 65% cacao content, the milk chocolate is “dark milk” chocolate, with a minimum of 40% cacao. The wrapper designs are an enigma: everything else about this company’s design is sophisticated (the Origin Bar wrappers, the bonbon designs and packaging, e.g.). The 3400 Phinney Bars look like children’s book illustrations—kittens, Arabian nights, mountain maids and llamas, young couples in love. Yet the products would never appeal to the youth palate (or to the unsophisticated adult, for that matter). We overheard retail buyers at a trade show commenting that the wrapper designs would work against the bars selling in their stores, and we agree: There’s a real disconnect. We ourselves are not sure we want to take a kitten or any of the other cutesy designs out of our pocket in public. Worse, most 12-year-olds who are attracted to the cute kitten-wrapped Bread & Chocolate bar will probably spit it out—a waste of a brilliant bar in the wrong hands. However, we urge you to overlook the design and enjoy the chocolate—it’s terrific. And we urge Theo to save these designs for a line targeted to younger folks and re-wrap them in something else: this is not whimsical snacking chocolate, but serious stuff that’s a privilege to eat. Bread & Chocolate Dark Chocolate Bar. A clever twist on pain au chocolate and chocolate bread spreads, Theo has incorporated buttery breadcrumbs into the chocolate to offer an intriguing textural experience and a freakishly exciting flavor combination. Consider this a chocolate connoisseur’s Nestlé Crunch bar! You can actually taste the bread as it crunches in your mouth and mixes with the chocolate, ultimately creating a unique experience unlike any other bar. Chai Milk Chocolate Bar. If you prefer your Chai Tea with chocolate, then step up to the plate and take a bite. Here, Theo has combined milk chocolate and spices (black tea, cardamom, cinnamon, clove and ginger) to create a mild-flavored bar that tastes as if you’re eating a solidified slab of chai tea. Coconut Curry Milk Chocolate Bar. Probably the most interesting pairing Theo offers, this bar is also one of the most tasty. Coconut flakes, milk chocolate and yellow curry meld into a savory yet sweet sensation that’s sure to raise a few eyebrows! Overall, though, the balance is superb and each flavor marries perfectly with the others. The combination might strike you as odd at first, but it will quickly grow on you—think of mole sauce! edge chocolate we’ve had in a while. Coffee Dark Chocolate Bar. Surprisingly, coffee pairs lusciously well with the tart and fruity Madagascar chocolate, as both flavors not only harmonize with each other but also enhance each other’s intensity! This is truly one of the better coffee bars available on the market – it’s strong and in-your-face, not backing down to subtleties or coy expressions. A dark roast all around, this is a stunning bar. Nib Brittle Dark Chocolate Bar. This isn’t your ordinary nib bar. The tart and fruity Madagascar chocolate shines brilliantly, and is further enhanced by the nib brittle scattered within. Nib brittle? Yes, that’s right, nib brittle! Theo has raised the bar (pun intended if you wish) by coating nibs with sugar and caramelizing them to add even greater dimensions of flavor and texture. Vanilla Milk Chocolate Bar. Simply put, this is a pure milk chocolate at 40% cacao content without any further additions to interfere with flavor. It’s got a sweet edge, that’s for sure, but it also whispers gently with the cacao’s natural flavors, which in this case, are red fruits. Slightly tart too, this is a milk chocolate with personality! Theo has recently added to the line with a beautifully designed selection of artisan bonbons—the first organic, Fair Trade artisan bonbons of our experience. Those who only eat organic and Fair Trade Certified foods will be thrilled; those who are looking for the next delicious box of chocolate to try will be merely very happy. The little chocolate jewels are handmade in small batches: artistic, enrobed, very creamy ganaches that melt in the mouth. The basic collection includes Burnt Sugar, Fig Fennel, Lemon, Mint, PB & J and Ivory Coast (a pure chocolate ganache). All of the pieces are enrobed in dark chocolate except for the PB & J: perhaps it seemed sacrosanct to match such comfort food as peanut butter and jelly to other than milk chocolate? We liked them all, but our personal was the Lemon, a white chocolate ganache bursting with fresh lemon zest (we admit a fondness for citrus and berry pairings with dark chocolate). There are also seasonal collections: The recent Aphrodisiac Collection for Valentine’s Day included Damiana (an herbal-based liqueur from Mexico with alleged aphrodisiac powers), Ginger, Hot Ceylon Cinnamon, Licorice, Merlot Pine Nut and Rose Caramel. Most organic products are not Fair Trade Certified, and many Fair Trade Certified products are not organic. The two terms are mutually exclusive, and are overseen by different certifying authorities. To include the term organic on packaging, a manufacturer must create its product in accordance with USDA rules. The USDA’s National Organic Program certifies products as organic based on farming, handling, manufacturing, distribution and labeling practices. Requirements include: no antibiotics or growth hormones, no synthetic pesticides or fertilizers, no sewage-sludge fertilizer, no bio-engineered foods or irradiation, and no GMOs (genetically modified organisms). 100% Organic: All ingredients, not counting water and salt, are organic. Products with this rating can use the green and white “USDA Organic” seal (image at right). Organic: At least 95% of the ingredients, measured by weight (excluding water and salt), must be organic. The remaining 5% can only be natural or synthetic ingredients that are not available organically, drawn from a preapproved USDA list. Products manufactured to this standard may use the “USDA Organic” seal on the label. Made With Organic Ingredients: Products with at least 70% organic ingredients may say “Made With Organic Ingredients” and list up to three ingredients. This category may not use the “USDA Organic” seal on the label. In the U.S., “certified organic” means that an independent organization accredited by the U.S. Department of Agriculture (USDA) has verified that a manufacturer’s products meet strictly defined organic standards as specified by the National Organic Program. This certification protects consumers and ensures the product’s value. Fair trade certification allows farmers to receive higher prices than they would in the conventional market. It means that the farmers were paid a fair price for their product and were not exploited by middlemen who pay them less than their crop is worth. They are paid at least 5 cents more per pound, and are able to earn earn 3 to 5 times more, than conventional farmers. Coffee (the world’s second most traded commodity, after oil), cacao, and other farmed products are often produced under sweatshop conditions. Industrial workers don‘t earn the legal minimum wage. Small farmers are paid less for their crop than it can cost to grow it, locking them into a cycle of poverty and debt and forcing them to keep their children out of school to work the farm. Small farmers usually can’t get credit, and can easily lose their farms. Under Fair Trade, importers pay an established fair price regardless of the volatile market. Credit is provided at low rates; and small farmers who use traditional, sustainable techniques don’t have to lose their farms to industrial cooperatives that employ pesticides and aggressive deforestation. The program also prohibits forced child labor, ensures safe working conditions and encourages environmentally sustainable farming methods as well as other measures to improve farmers’ lives. Fair Trade is part of a larger movement that began in the 1940s, with churches selling crafts made by World War II refugees. Fair Trade certification began in the Netherlands in 1988 due to of plummeting prices in the world coffee market. Today, 20 countries have labeling programs using shared criteria under the umbrella of Fair Trade Labeling Organizations International in Germany. In the United States, there is certification for cocoa, coffee, rice, fresh tropical fruits, sugar, tea and vanilla. For more information about Fair Trade visit Transfairusa.org and GlobalExchange.org. If you’re in Seattle, visit the factory and retail store that features all of Theo’s products plus a few surprises. The hours are 11 a.m. to 5 p.m., seven days a week. Public tours are given daily at 1 p.m. and 3 p.m. ($5 per person for ages 6 and older); reservations are recommended. Private tours are available by appointment ($100 minimum fee). Telephone 1.206.632.5100. It seems that every time we walk into a store that sells fine chocolate bars, the colorful Theo products are instantly visible—it’s hard not to notice them (see the photo below). But if you don’t find them locally, pop over to the company website and treat yourself to some bars (and bonbons!) and see what great organic, Fair Trade Chocolate tastes like. We can honestly say, it’s the best we’ve ever had! 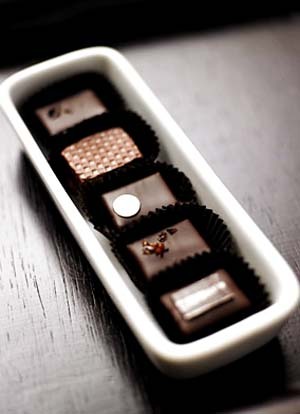 FORWARD THIS NIBBLE to connoisseurs of fine chocolate and those who like organic and Fair Trade Certified foods. Also available at fine retailers. publication but are subject to change. FOR ADDITIONAL INFORMATION, special offers, contests, opinion surveys, THE NIBBLE back issues archive, product gift-finder, links to our favorite food websites, and the ability to nominate YOUR favorite nibbles, visit the home page of TheNibble.com. Do you have friends who would enjoy THE NIBBLE? Click here to send them an invitation to sign up for their own copy.